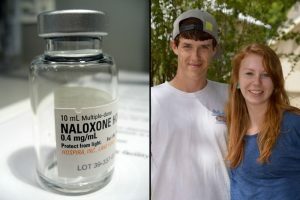 Naloxone, often known by the brand name Narcan, is available as a nasal spray, a pre-loaded injectable shot or in a vial that can be administered with a syringe. When a person overdoses on an opioid, their breathing and pulse slow, leading to brain damage or death. A dose of naloxone stops those effects for 60 to 90 minutes by binding to the brain’s opioid receptors and essentially switching them off. Naloxone doesn’t “cure” an overdose because opioids remain in the bloodstream for at least four to six hours, but it creates a window during which a person can receive emergency care. When Miles died, naloxone was only available in Texas to people with a doctor’s prescription. Beginning Tuesday morning, Texans will be able to obtain naloxone without a prescription at any of 715 Walgreens pharmacies in the state, Walgreens spokesman Phil Caruso confirmed. This entry was posted in Drug War, Health/Medicine. Bookmark the permalink.